Here is a new one for immediate sale in the Etsy shop folks, made one of these for a 2013 Harley Sportster 48 not too long ago and liked the look enough that I made up another one. It was made to fit the single seat bolt Harley Sportster and Softtail models including the Blackline and Slim. Will not fit Deluxe, Duece models with two bolt seat bracket. Custom two tone rear fender bib in Saddle Tan and Antique Brown with Coyote Tan stitching. Smooth burnished edges & medium brown felt underside complete the color theme. The bib is approximately 3 1/2″ wide x 14 1/2″ long. Bolt holes are 11 1/4″ apart on center. Seat side hole is slightly oblong to allow for small adjustments. 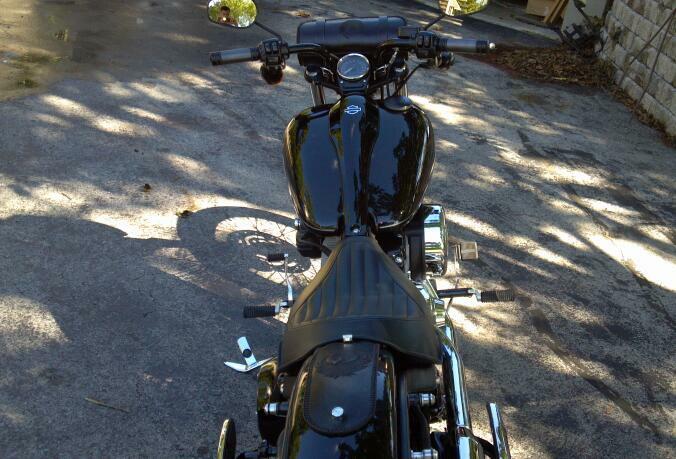 The second photo shows similarly constructed bib mounted on a 2011 Harley Blackline.